Key difference: Complex refers to the number of components in a system, whereas, complicated refers to the level of difficulty of something. Complex and complicated are two terms that often used interchangeably. This is mainly because they have a similar context. However, the context does actually differ. Hence, while they may actually be used as synonyms, using one instead of the other actually changes the context of the sentence. The term ‘complex’ is generally used to refer to the level of components in a system. It is when something is composed of a lot of different components. These components or parts may or may not need to fit in a particular pattern. For example: complex machinery. A complex problem may have various different steps to determine the solution to the problem. 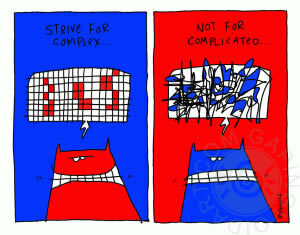 However, being complex doesn’t necessarily entail that it is also complicated. The term ‘complicated’ entails that something is difficult. It does not have a simple or a straightforward answer or solution. It can also entail that there are various different factors to be considered before obtaining an answer, such as a complicated relationship or a complicated medical procedure. For example: a guy and a girl are dating but the relationship may be complicated, as there are a number of various factors to be considered, such as their pasts, their compatibility, etc. In summation, complex refers to the number of components in a system, whereas, complicated refers to the level of difficulty of something. Another way of differentiating the two is to note that ‘complex’ is usually used in a technical scenario, such as machinery, devices, etc. ‘Complicated,’ on the other hand, is mainly used in a more social situations, such as relationships or feelings.